I am consistently enjoying the way Suicide Squad is split between two stories. The lead story, with the whole Squad, has been slam bang action every time. In this issue, the team is stuck in a Russian fortress, having to deal with General Zod and a battery of Russian metahumans. So it’s pretty much high intensity battle from start to finish. There are some very nice touches of humour. Zod’s moment with the “graphic designer” would be my favourite. And we get some behind the lines drama and manipulation with Amanda Waller and Harcourt. The action is spread more widely among the members of the team than in the last couple of issues. Though I have to admit, I have no idea why the Enchantress was used in this story, aside from being in the movie. The back-up stories have been of very high quality, and this issue’s proves no different. Exceptional art by Gary Frank as Rick Flag goes on a mission with Harley Quinn, to determine if she is stable enough for the team. And wouldn’t you know it, they walk right into a trap laid by the Joker. 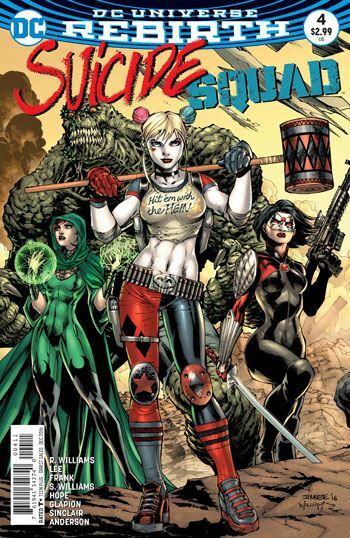 It’s a much more serious and intense portrayal of Harley than usually appears in this book. Or her own book. Her boundaries and her loyalties are not always the clearest, but as this story proves, that is part of what makes her such a compelling character.